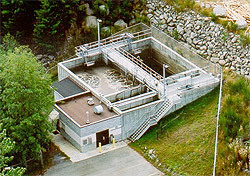 Wastewater from 56 connections in the Duke Point service area is treated at the Duke Point Pollution Control Centre (DPPCC). Wastewater is gravity fed and pumped to DPPCC via 3 pump stations - McMillan Road Pump Station, Cedar Road Pump Station and Duke Point Pump Station. The DPPCC uses Secondary Treatment to remove 95% of BOD and TSS. Sludge from DPPCC is trucked to the Greater Nanaimo Pollution Control Centre where it undergoes further treatment to become Biosolids. Effluent is discharged into the Strait of Georgia 242 m off shore at a depth of 43 m.
To learn more, please visit our Treatment Processes page. The RDN is dedicating $50,000 from the federal Gas Tax Fund transfer to complete a Sewer Servicing Study for Cedar Village and to examine options for properties within the Cedar Village to connect to the Duke Point Pollution Control Centre and pay for their required capacity. Study completion is targeted at December 2015. Expansion from a one basin Sequencing Batch Reactor to a two-basin system as flows increase.